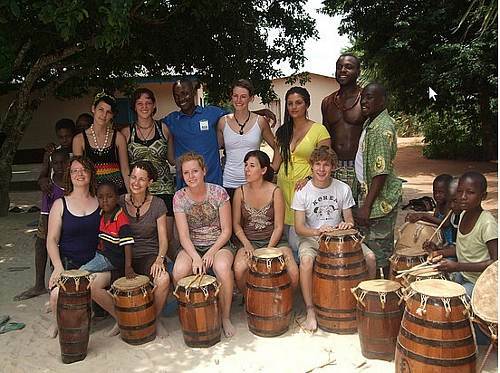 Every summer a music school led by Master Drummer Kwasi Dunyo and other eminent teachers runs in the village. Students come from around the world to learn the traditional drumming, dancing and singing of the Ewe people. Daily lessons run for 2-4 hours, covering both recreational and religious musical styles. In a few short weeks students become proficient enough to perform with community drumming groups in Dagbamete and nearby villages. Students experience the culture, the food, and the people in an all-immersive manner. USD 25 per person for 2 hours or USD 45 per person for 4 hours. West African Cultural Exchange, Kwasi Dunyo, Director. This is a tour led by Master Drummer Kwasi Dunyo that combines the summer music school above with added excursions to Accra and Cape Coast to visit historic and haunting slave castles, beautiful fishing towns, a monkey sanctuary, and the Kakum National Rainforest. For more information, and to register, visit Into the Sound of the Drum.